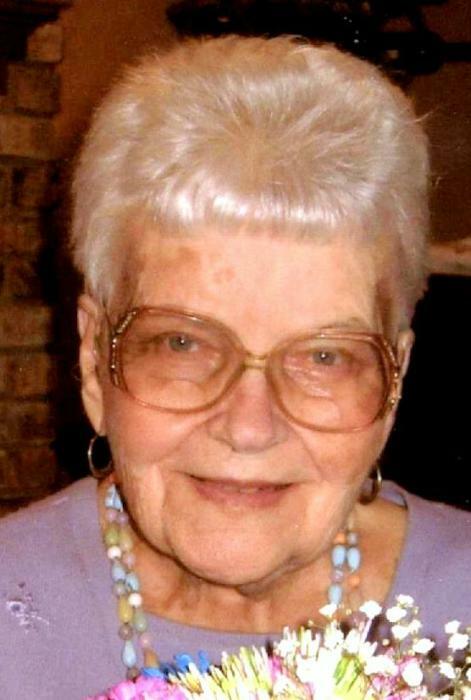 Eileen B. Byrne, 92, of Delphos, passed away on Thursday, September 27, 2018, at Vancrest Healthcare Center of Delphos. She was born March 16, 1926, in Delphos to Lloyd R. and Mary Vera (Donovan) Butler. She was united in marriage to Walter D. Byrne on August 14, 1945, in Ottoville; he preceded her in death on February 4, 2017. She is survived by a son, Timothy (Ann) Byrne of Delphos; a daughter, Joyce (Greg) Early of Lima; three grandchildren, Jason (Carly Neil) Early, Alisha (Steven) Snavely, and Colin Byrne; and three great-grandchildren, Ashlynn and Tanner Early and Andrew Snavely. She was a member of St. John the Evangelist Catholic Church and was a homemaker. She enjoyed gardening, cooking, and baking. Her greatest enjoyment was going to garage sales. Eileen was a loving wife, mother, grandmother, and friend. Mass of Christian Burial will be at 11:00 a.m. on Monday, October 1, 2018, at St. John the Evangelist Catholic Church. Burial will follow in St. John’s Cemetery. Fr. Dennis Walsh will officiate. Visitation will be held on Sunday, September 30, 2018, at Harter and Schier Funeral Home from 2:00-8:00 p.m. where a Parish Wake will be held at 8:00. Memorial contributions may be made to the activities department at Vancrest Healthcare Center of Delphos.